For my lunch break on Fridays I typically go to the Farmers Market Downtown. Buy some of the local seasonal fruit and grab a bite to eat. Usually I’ll grab some nectarines and peaches (both white and yellow), plums, strawberries, herbs, and some aromatics. It’s been a while since I’ve cooked up some leafy greens, so I knew I wanted to buy Swiss Chard, but they didn’t have any. 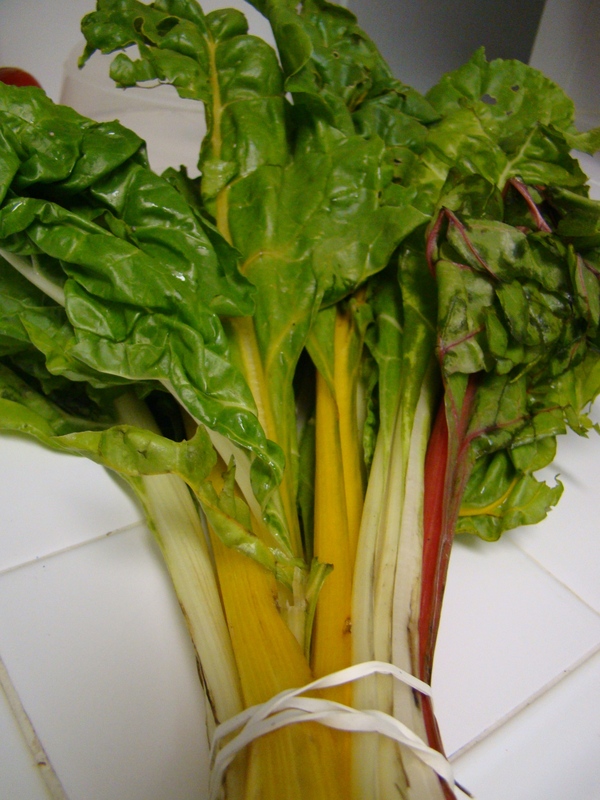 However the Rainbow Chard caught my eye. 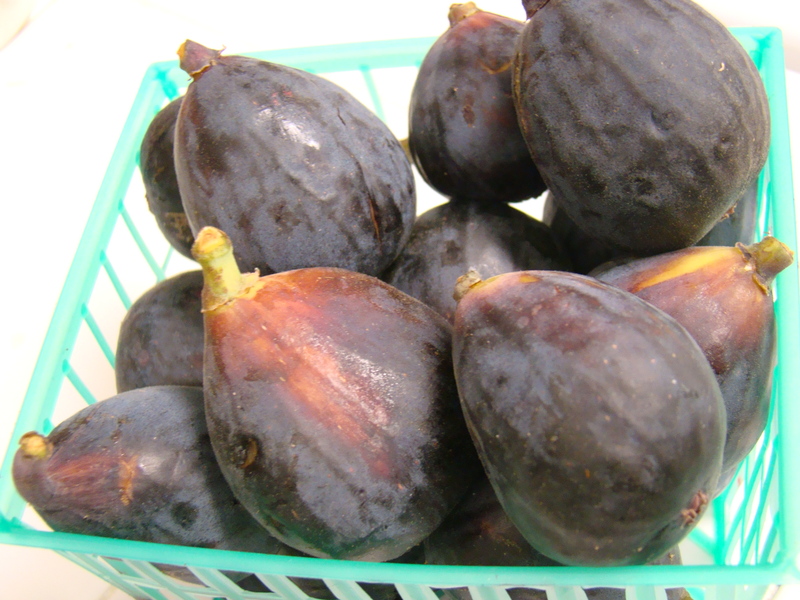 Another thing that was new this week and hasn’t been up in previous weeks are figs. I’ve had them in salad and with cheese but I haven’t tried to cook with them, so I’m going to challenge myself and look around for some recipes to make something with these. Hopefully whatever I make it will turn out successful. 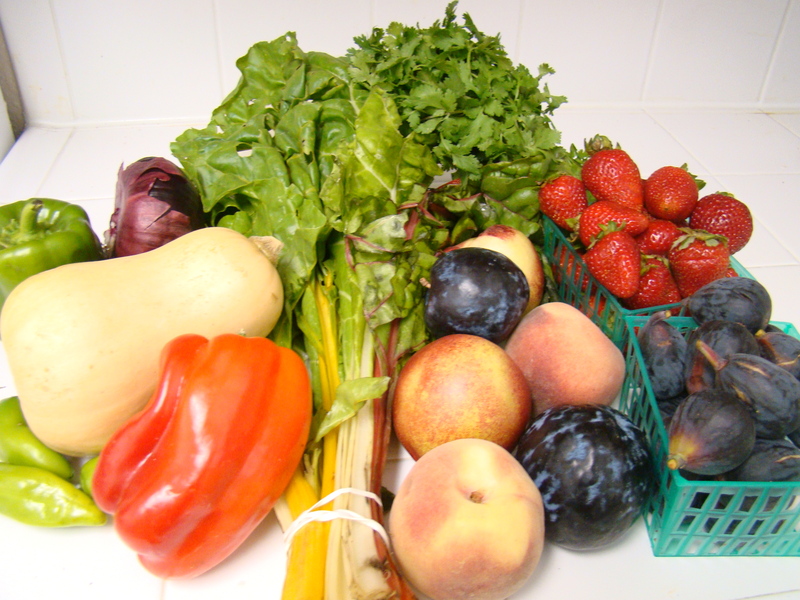 I love going to the Farmer’s Market and looking at all the fresh produce grown locally. Something about going every Friday reminds me of when my mom used to go when we lived in Vallejo. I love fruit. I have to have fruit in the house or I just feel guilty and unhealthy. I guess my mom taught me well. So going to the farmers market is a treat and a stroll down memory lane. Look at everything I purchased for $13 (some organic, some not). I’m really looking forward to what I can spruce up with the butternut squash. I have some pancetta and I’m hoping to make some butternut squash pancetta risotto. I had some at an Italian restaurant in the UK and it was so DELISH. Since it’s still pretty warm during the day, I decided to wear a dress. I’ve been in jean shorts lately that I wanted to change it up. So I pulled this dress. My mom purchased this dress when I had just hit puberty. That’s about 15+ years ago. I remember wanting to borrow this dress from her in middle school so bad but couldn’t because spaghetti straps weren’t allowed in school. But the straps weren’t even that thing. MEH. And when I could wear it outside of school I got a bit heavier where the dress would no longer zip up (I was semi-big girl in high school.) About three years ago I started looking around in her closet. She doesn’t wear some of her old stuff so I figured something would interest me because she has so many blazers and I desperately needed some for work. I came across this dress and tried it on and it fit. It was a smidge snug in the waist but it zipped up and I wasn’t gasping for air, so I took it home with me. I ended up wearing it for lunch on my 25th birthday with a red belt. But you know what I LOVE about this dress more than anything (warning I’m going to sound like a girly toddler)… it TWIRLS. It sways. It billows out when you turn. 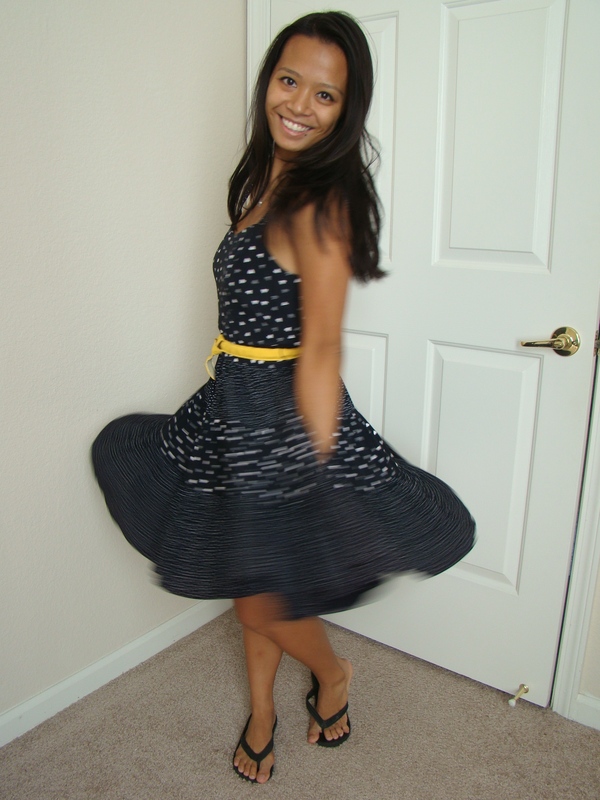 I love circle skirts and dresses they just remind me of a simple time and just bring out the kid girl in me. The dress looks a tad flamenco-ish in the following pictures but it’s not! 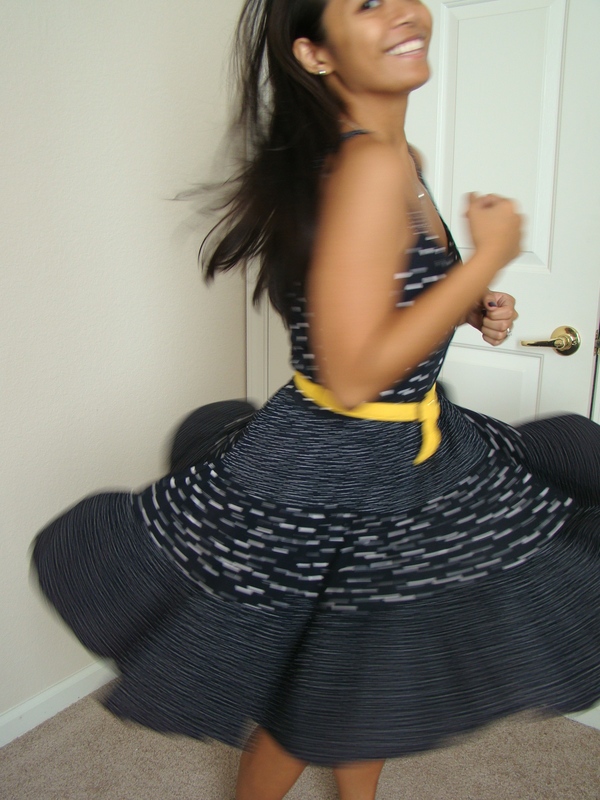 Don’t you just love a good twirling dress? < Previous are you ready for some football?? ?